Hey everyone -- while digging through the past is fun (and a great sinkhole of time), it can also be mighty frustrating. I'll give you an example. 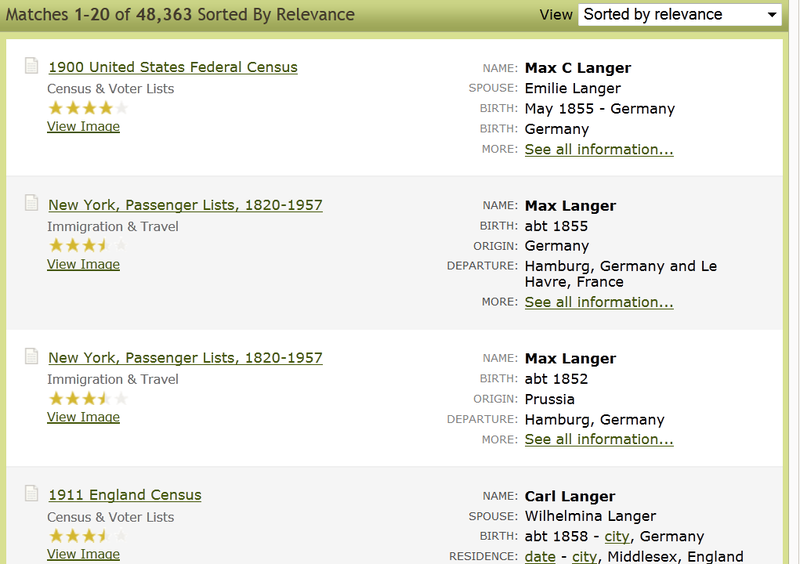 We get three Max Langers, none of whom could be our Max Langer, because all of those sources are based in the United States (NY passenger lists, 1900 US census), and Great-grandpa Max never came to the United States. Notice that up at the top of the picture, there's a line that says, "Matches 1-20 of 48,363" Yikes!! Do I have to go through all that?? 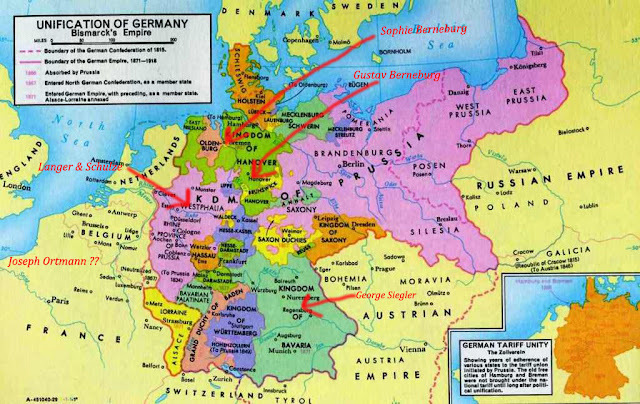 Same thing happens with Wilhelmina Schulze, except that there's one possibility, something in the Mecklenburg-Schwerin, Germany, Census, 1867 (in German). I click on that with great excitement and . . . they won't let me see it unless I upgrade to a worldwide membership, for a lot more $$$. Bummer. 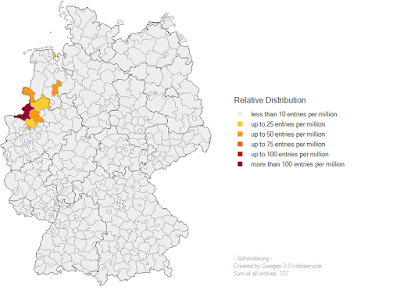 Here's the thing about researching ancestors in Germany -- despite how orderly they always seem to be, records were not kept nationally, because Germany wasn't really a nation until 1871, when all the states were unified into one country. Prior to that, it was a whole mess of independent states that all kept their own records . . . but usually, they were kept in a church, not in a government office, which again makes things more complicated. If you don't know where your ancestor went to church . . . 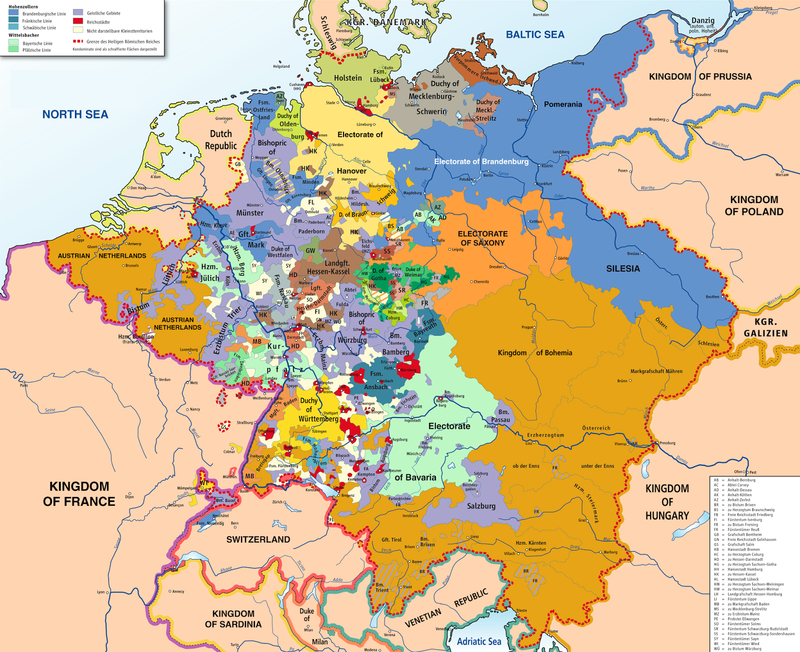 Here's a map of Germany before 1871. Every color is its own little country. So you can see, so far our ancestors come from a number of different states; Joseph Ortmann is off to the side, because all I can get on his birthplace is "Pommern," which is the whole pink area, and I don't have an idea of whether it's East or West. So there isn't one database I can go to -- it's probably 6 or 8 different databases I'd have to go through to find him. Yup, this is our Max -- see where it says his occupation was "Chimney Sweep"? That's what he did for work. (Mighty sooty, that kind of work!) So now we have his birth date as "Abt. 1855" and a death date -- "Before 11 September, 1909." Why "before"? Probably, the old gentleman was looking at census information that showed Max, but then on the 1909 one, he wasn't there any more. But look -- we have a city! 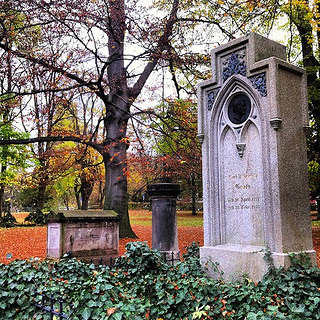 He died at Goettingen. Hmmm. Where's that? 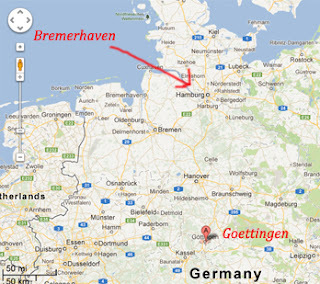 Now there's another mystery -- if he was living in Bremerhaven with Wilhelmine, and she didn't pass away until 1918, then why would he go to Goettingen before 1909 to die? Could that be where he's from originally?? I have to look into this some more. See that line after the dash? Up at the top it says Langer, J., who is a pharmacist evidently, and then after the dash it says "Max, working man, Leher Chaussee 92." The Leher Chaussee part is his address, but unfortunately, I can't find that street on a modern map of Geestemuende. I'll have to look for a historical map. Another person on the list said that the fact that Max was listed as an "Arbeitsman" means that he couldn't have been a "Schornsteinfager" (chimney sweep), because a chimney sweep had to be licensed and have papers and so on, and he would never have called himself "Arbeitsman" if he had been a skilled tradesman. (He would have been insulting himself.) 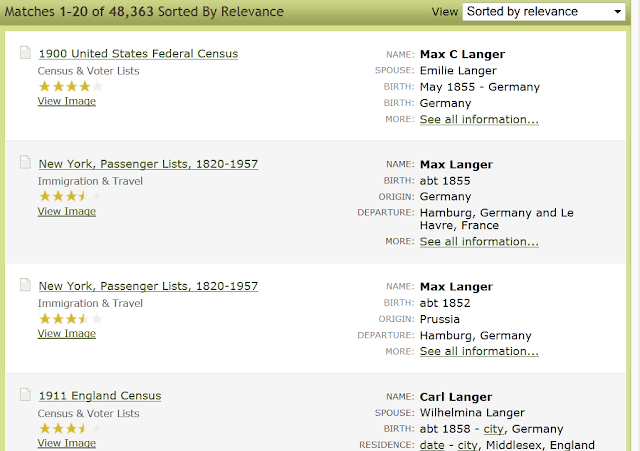 But look at the date: if we accept 1855 as Max's birthday, then in 1869 he would have only been 14 years old! Would he have been listed by himself at that age? Is that really our Max, or some other pretender, trying to confound us?